LAWRENCE — The Kansas African Studies Center will host a public forum highlighting the possibilities for meaningful conversation about immigration through the sharing of stories. The forum will take place at 7 p.m. May 9 at Unity Temple on the Plaza in Kansas City, Missouri. This community gathering will begin with presentations by three speakers, followed by a moderated public discussion on the challenges and opportunities that arise from recent demographic changes in the Midwest. The forum will bring together acclaimed Nigerian novelist and poet Chris Abani, Northwestern University; distinguished cultural geographer Garth Myers, Trinity College, Connecticut, and nationally recognized expert on Latino/a migrant experiences Marta Caminero-Santangelo, University of Kansas. Teleconferencing technology will connect an audience in Garden City with the forum in Kansas City and enable dialogue between the two communities, both of which are hubs of recent resettlement for Africans in the Midwest. 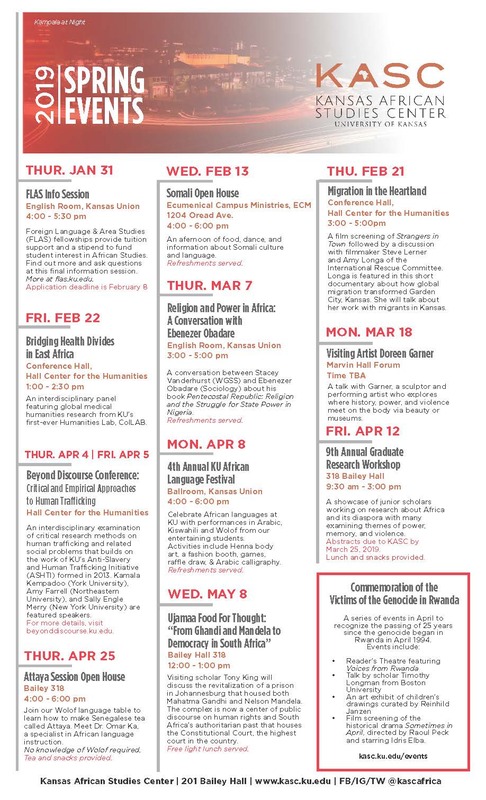 The forum is a central component of a Kansas African Studies Center initiative funded by the National Endowment for the Humanities to facilitate the sharing of migration stories about Africans in local communities through public discussions, community programming and the creation of educational resources. With close to 10,000 African immigrants living today in the heartland metropolitan centers of Kansas City, Lawrence, Topeka, Emporia, Wichita and Garden City, the project will offer extended and productive dialogue surrounding shifting demographics due to migration. In addition to the public forum, community programming will include humanities workshops in storytelling, poetry, theatre and visual art. The Kansas African Studies Center is partnering with the Kansas Humanities Council and the Kansas City public radio station KCUR to sponsor radio shows, film and book discussions, and engaging talks that reveal the power of migration stories. Details about the free public forum and the yearlong project are available at: http://migrationstories.ku.edu.